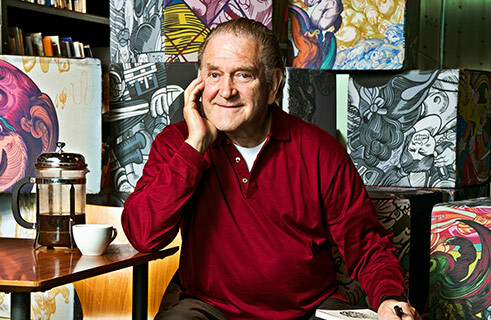 In 1989 Erró gave the City of Reykjavík a large collection of his works, a total of about 2,000 items, including paintings, watercolours, graphic art, sculptures, collages and other works spanning the artist's entire career from his youth. In addition to the art works, Erró gave the city an extensive collection of private correspondence and other documents relevant to his artistic career. These rich sources are of great value for all research on the artist Erró and his time. The collection has grown steadily over the years; Erró has continued to add to the gift and in addition works have been purchased for the collection, which now numbers about 4,000 works of art. Exhibitions from the Erró collection are a regular fixture at the Hafnarhús site of the Reykjavík Art Museum, with the purpose of giving as clear an image as possible of the diverse character of the artist's works. Reykjavík Art Museum has a little over 70 sculptures by Erró. Most of them are from his student years in the 1950s at the Icelandic College of Arts and Crafts (forerunner of the Iceland Academy of the Arts). The few sculptures he has made since then date from 1959–63. These are assemblage pieces, a kind of three-dimensional collage composed of materials which Erró found on rubbish dumps and at street markets in Paris. His first assemblage pieces were made for the series Mécamasks in 1959. In 1962 he made sets and props for a short film by Éric Duvivier, Concerto mécanique pour la folie ou La Folle Mécamorphose. After 1963 Erró rarely worked with the assemblage form. Reykjavík Art Museum has approximately 900 prints by Erró, created using a variety of techniques. In his student years, Erró used mainly stamp prints, etchings, linocuts, woodcuts and metal. In 1958–62 he focused on lithography, which is a quicker, more spontaneous form. In later years Erró has been working increasingly with digital printing. For Erró graphic art is to painting what audio recording is to music: a powerful medium for disseminating his work, making it accessible to a mass public. Reykjavík Art Museum has about 2,500 drawings by Erró. Most of them date from the period from around 1944, when Erró was 12 years old, to 1963 when he started using collages rather than sketches as the basis for his paintings and watercolours. From the early 1980s his watercolour sketches (here categorised with the drawings) have formed an additional stage between his initial collage and the final painting. A black- and-white drawing has in some cases been added as one of the stages in Erró's creative process, interpolated in the process from collage via watercolour to the final painting. In the 1960s, Erró experimented with film, and made Grettur (Grimaces) with a number of fellow-artists. The Reykjavík Art Museum has a catalogue of all of the artist's film work. Reykjavík Art Museum possesses more than 600 collages by Erró. The oldest of these were made at the Icelandic College of Arts and Crafts (forerunner of the Iceland Academy of the Arts) in 1950–51. In 1963–64 there was an important turning point in Erró's art, when he stopped depicting fantastical creatures and instead opted to work with collages based on mass-produced images of our consumerist society, which then became the models for paintings or prints. Since then Erró has been in the habit of creating collage sketches for other pieces, and the same motifs are often seen in a collage and a painting, print or watercolour. In 2010, a retrospective of Erró's collages was held in the Centre Georges Pompidou in Paris. Án titils / Skissa fyrir The Sacrifice?